As cryptocurrency has gained popularity, it was inevitable that some of the elements of the conventional financial world would bleed over. Regulations, futures, and ETFs have all nosed into crypto markets (or have attempted to) in various ways, and index funds are right there with them. In 2017, a large number of crypto hedge funds also cropped up. But for the average investor, affording minimums or having the right contacts to get into a hedge fund presents a real challenge. Cue index funds. For anyone who doesn’t know, index funds are mutual funds that are designed to track the returns of a market index. 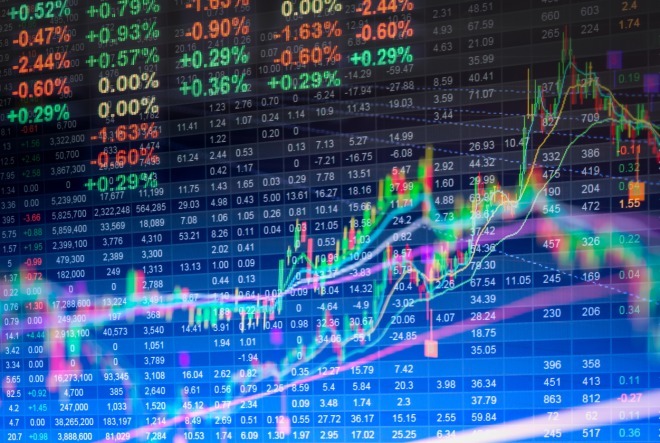 An index is a group of securities that represents a particular segment of the market. In crypto, an individual token is often introduced to serve this function. For professional traders, old hands, and other power players, index funds don’t represent a very exciting potential. But for those who are new to the space, they may be an attractive option. Interested in blockchain but don’t want to spend the time learning about each coin or technology? Interested in cryptocurrency but don’t want to worry about the storage and custody of your tokens? Want an easy, diversified, and auto-rebalancing way to invest? An index fund might be the answer for you. Let’s take a look the options. The BTWTY token is an investment vehicle that takes into account the performance of the top 20 cryptocurrencies, thus functioning in a similar way to the S&P 500 (which tracks the top 500 US company stocks). Here is its performance since inception. Crypto had a sensational year in 2017, and a less than stellar start to 2018, Bit20 is obviously a reflection of that. But how safe is it, you might be wondering? Since BTWTY is a smartcoin that runs on the blockchain, it enjoys the same level of security as other blockchain-based applications. To date, blockchains have generally proven to be much more secure than centralized alternatives. How can you buy BTWTY? In order to buy into this index, you’re going to need to have some bitshares (the currency of the platform BTWTY runs on). This can easily be achieved by setting up an account and transferring bitcoin in. A step by step guide on how to buy can be found here. Cryptocurrency exchange Coinbase recently announced the establishment of a passively managed Index Fund. Unlike Bittwenty, Coinbase is a latecomer to this particular party. In retrospect, the move makes sense as Coinbase is a runaway leader in a booming industry and needs to find new ways to continue growing. Coinbase’s fund will allow investors broad exposure to all assets listed on GDAX (weighted by market capitalization). How can you buy into this index? The Coinbase website says the fund will be open for investment in 2018 without further elaboration. If you’re interested, you can sign up to be notified when applications are open. The fund is expected to add other coins in the future, and its allocation will be rebalanced every year. For those concerned about safety, all funds will be held by Coinbase in cold storage, which could be a plus considering their experience managing such high-value assets. Some people will undoubtedly take issue with this, but Coinbase doesn’t have the worst record. They even have a service called Coinbase Custody, which aims to store bitcoin for institutional investors. To learn more about Coinbase’s Index Fund or sign up for updates, click here. Initial R&D for the Crypto20 fund began in April 2017 and has since progressed along the roadmap from publicity to presale to full-on ICO. You can read their whitepaper here. What exactly is it though? C20 is an Ethereum-based token that works as “an autonomous, high-performance, low-cost cryptocurrency index fund.” It’s another prominent offering for those who wish to purchase a basket of coins. There was quite a bit of buzz surrounding C20, but also some skepticism. It’s fair to ask the question, how safe is it? The C20 also runs on the blockchain, thus offering full transparency and a relatively high degree of security. As for the company behind the token, initial feedback appears positive – strong communication, a growing community, and a pending audit by one of the big four accounting firms are all positive indicators. How can you buy the C20 token? If you missed out on the presale or ICO (which was not available to US residents), then your only option will be to buy it on an exchange. The C20 token can be traded at Bibox, IDEX, HitBTC, and ED. 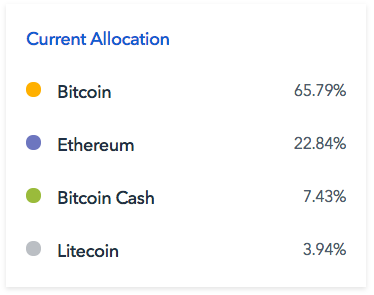 Here is the fund’s current allocation. What fees are involved? Due to its unique structuring, C20 offers management fees of only 0.5% and — best of all — no exit fees. This is among the best offers on the market and if this thread is to be believed, C20 is currently the strongest crypto index contender. Hold10 allows you to “own the market not try to pick winners.” More about their methodology can be found here. Despite being headed by two relatively unknown entrepreneurs, Bitwise received $4 million in seed funding, has gotten a lot of press, and is backed by the likes of Naval Ravikant. Here is its performance so far. Again, you can see that Hold10 has had an exceptional year, mimicking the crypto market’s meteoric rise (and early 2018 dip). But what kind of safety concerns are there? If you buy into Hold10, your funds are held in 100% air-gapped cold storage, except for when the portfolio is rebalanced once a month (to account for fluctuations in pricing among the assets). The company itself is based in San Francisco and, from the outside, appears rock solid. How can you buy into Hold10? Their requirements are a bit more stringent. In order to purchase, you must be a US citizen and an “accredited investor.” Since it’s a private vehicle and not an ETF, the minimum is $10,000 – which is still less than many other current alternatives. The fund comes with an annual passive management fee of between 2% to 3%. To learn more about Hold10 including its hard fork policy, data selection process and detailed eligibility criteria, click here. What is Iconomi? Iconomi is a blockchain platform that allows anyone from beginners to experts to invest in and manage digital assets. Iconomi is aiming to “bridge the gap between the public and the distributed economy”. This is more than just a marketplace though; this is a real stab at creating a simple, user-friendly option for people to invest in combinations of assets referred to as Digital Asset Arrays (DAA). Each DAA manager can create their own assortment of specific digital assets and offer them to a community of supporters. This allows people to build and buy into customizable assets, including Iconomi’s flagship DAA, the blockchain index (BLX). However, any real protection against volatility is obviously not possible in crypto markets in their current form. In terms of key safety, some users trust Iconomi’s platform security, while others opt for hardware wallets. How to buy BLX? According to the official site, you can purchase a DAA in “just a few clicks”. But just in case this is overly optimistic, Hackernoon has created an excellent guide for purchasing BLX that takes you step-by-step. To learn more about Iconomi and the BLX index, you can visit the Iconomi dashboard. While the five we’ve mentioned here might be the best known or most interesting, that doesn’t mean they’re the only options in the market. 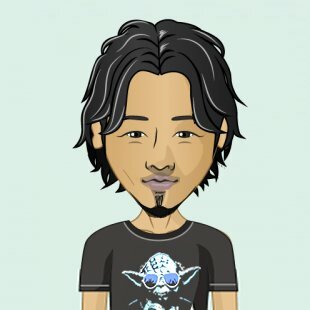 So in light of that, here is a list of other index coins or funds that may be worth a look. AgreCoin – a platform that works to compile the top 6 coins in the market at any given point, and makes them into their own fund. Astronaut Capital – aims to put crypto investing on “autopilot” and with an ERC20 backed token is the “gateway to a managed portfolio targeting high volume and high demand crypto startups that are nearing a liquidity event”. Symmetry Fund – (SYMM) offers investors the opportunity to gain exposure to the cryptocurrency market without the complexities of personally trading it themselves. Digital Developers Fund – a fund that invests in a spread of digital assets such as domain names and cryptocurrencies. Should You Invest in a Crypto Index? There are many reasons indexes are popular, so why not give one a spin in cryptoland? Many people are currently running or participating in this experiment as we write this. But as with all things crypto, no one really knows how it will turn out. That doesn’t stop people from trying to make predictions, though. 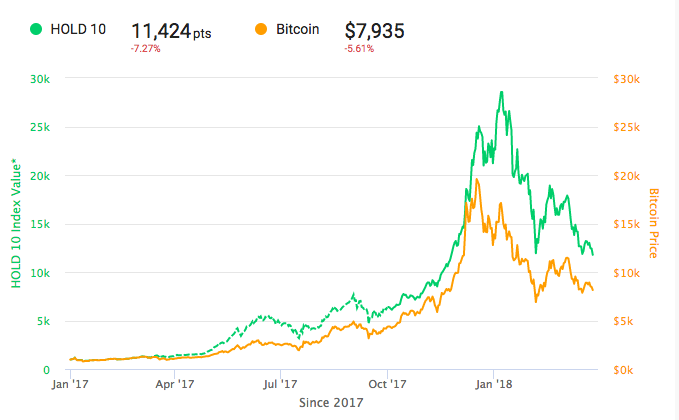 Things have obviously changed a lot since 2016, however, and current index offerings incorporate bitcoin, rather than pitting it against the rest of the market. But the question remains: is spreading your money across a spectrum of coins more likely to yield the profit maximizing–risk minimizing effect investors hope for? How you answer this question will come down to the perspective you choose to adopt. Other people see an altogether more rosy landscape. They see bitcoin as an anchor of value, and they see many other tokens starting to address real use cases through innovative tech. They look at the total market capitalization of crypto (and how it’s still dwarfed by the S & P 500) and conclude there is still abundant room for growth. This second group feels that we are at the dawn of something huge, and with the benefit of more data (more than a year has passed since Woo made his statements) are more bullish. From this viewpoint, diversifying across the market could be an excellent strategy. Many people will overlook index funds as they chase the next pump or try to prognosticate the value of a technology barely in its infancy. Others will take a DIY approach to indexing, but this requires far more know-how than the average beginner has. The problem remains, with 1500+ cryptocurrencies to choose from — and more appearing seemingly by the minute — it is extremely difficult to separate the wheat from the chaff. Also, despite what some people might tell you, predicting the long-term success or failure of cryptocurrencies is very challenging even for traders in traditional markets with many years of data to review. Buying a single token or index is an easier and less-stressful approach than just about anything else. As the market evolves, the value proposition of a crypto index fund — offering investors exposure to stable returns while maintaining a broad, limited risk profile — could become increasingly appealing. Whether or not you decide to invest in a crypto index largely comes down to two things: where you fall on the optimism/pessimism spectrum as it relates to crypto markets and how much you value the ease of use an index provides (i.e. are willing to pay a little bit in fees). At the end of the day, everyone will have to make these determinations for themselves. C20 only charges 0.5% per annum as operational fees, but there are no exit fees. You didn’t cover the best one 🙂 i.e. Astronaut (www.astronaut.capital/) – a fund targeting ICOs. 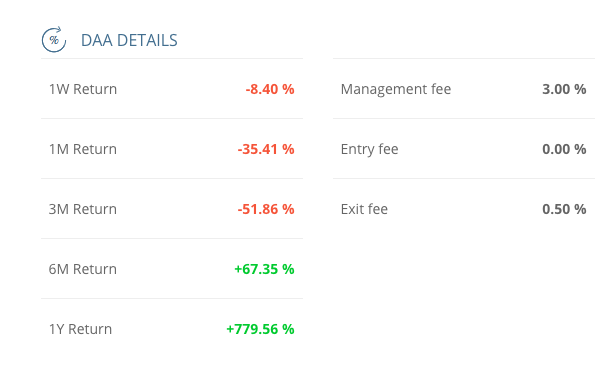 Best thinv with Iconomi is that if you hold icn you are gonna get your fees back because of burning tokens from the DAA fees. Plus iconomi is way ahead of the others regarding the development. Heck blx is even being listed on the stock exchange.